The famous Nuvolari & Lenard studio designed the new Palmer Johnson 36.5m Express MY/PJ227, an aggressive open that features flowing and harmonious lines. The planing hull is in aluminium, a material that ensures a tough yet light structure as well as permitting excellent management of inertial mass distribution. The design is developed on two and a half decks, the half being a small flying bridge with a modern open air station equipped with all the steering controls present on the main deck indoor bridge. For outdoor activities this Palmer Johnson open offers the main deck and the flying bridge, while the night-time area is below. Nuvolari & Lenard have created a deck of harmonious design, featuring a cockpit that descends aft until it becomes one with the sundeck and thus, with no transom, a single area that is very liveable both under way and at anchor. The only element separating the two areas is a refined stainless steel stanchion-rail surrounding the aft sundeck and set into the deckhouse. The cockpit has a central table, two three-seat sofas at the sides, a five- seat sofa aft and a spacious sundeck. The tender is kept in a "garage" forward, between the deckhouse and the sundeck, fixed in a transverse position and easily handled with a retractable davit. The house top, as the small flying bridge is defined, features an external control position with two armchairs and two circular sofas aft, with accompanying low table. The deckhouse is characterised by a soaring design and a large number of windows that let plenty of light in. The daytime area includes a spacious saloon, a dining area and covered bridge. All the interiors feature widespread use of wood and precious fabrics that combine to make every room elegant and welcoming. The dining area has a round table surrounded by a C-shaped sofa and chairs. Forward of the dining area there is a low, wooden glass-topped table for moments of relaxation. The saloon has three sofas, one set into an elegant bookcase. The galley is forward of this area and separates the living quarters from the modern command bridge which occupies the whole width of the deckhouse. The wheelhouse is all in wood and is notable for its refined design and the presence of four comfortable armchairs. The night-time area is on the lower deck and consists of the owner's suite with double bed, sofa, office, private bathroom with twin washbasins, WC and separate shower cabin. There are three guest quarters: two VIP cabins aft, with queen-size beds and private bathrooms, and the third with twin beds and an adjacent bathroom. There is another guest bathroom on the lower deck with WC and washbasin. The crew have two areas: a four-berth cabin and two bathrooms at the forepeak, and a dinette, laundry and galley aft. Two 2.250 HP MTU engines power this yacht at an estimated speed of 30 knots. 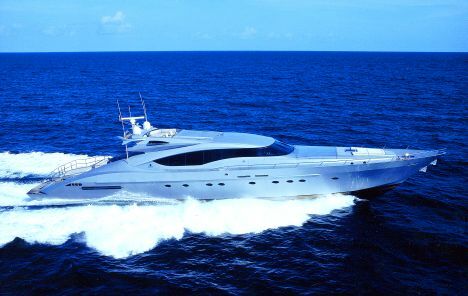 For further information, visit website www.palmerjohnson.com or contact Palmer & Johnson Yachts; 1515 SE 17th Street; Ste 109; Ft. Lauderdale; FL 33316; tel. 954 765 5555; fax 954 765 5550.